President and Executive Producer of ASR Media Productions and host of The PEAK TV will lead a panel discussion at the event. 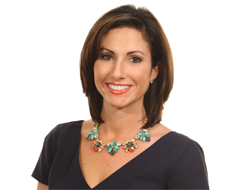 BETHLEHEM, Pa. - Oct. 26, 2015 - PRLog -- Ashley Russo, two time Emmy® winning executive producer and president of ASR Media Productions, will chair a panel discussion featuring regional business leaders at the inaugural CREW Lehigh Valley Legacy Summit. The all-female panel will share stories of risk and reward that they have experienced throughout their careers. Past CREW presidents conceived the Legacy Summit to be an annual program focused on professional development for women. The event, We Dare You: The Rewards of Risk Taking, will address different strategies for breaking through comfort zones as a means to progress careers and create successes in life. The summit will be held on Tuesday, October 27th from 8 a.m. to 1:15 p.m. at the Renaissance Hotel, Allentown PA.
• Jane Long, Esq., Chair of the Corporate, Business and Banking Group and a shareholder of Fitzpatrick Lentz & Bubba, P.C. Ms. Long is a former board member of CREW LV. • Elaine D. Pivinski, founder and owner of Franklin Hill Vineyards. Ashley Russo is a two time Emmy® award winning executive producer and president of ASR Media Productions. Ms. Russo also hosts The PEAK TV, an ASR Media production featuring health, wellness, lifestyle, and community stories airing every Sunday on WFMZ - Channel 69. Russo has been awarded two Mid-Atlantic Emmys®, receiving a statue in 2013 and 2015; she has earned five nominations over the past three years. Ms. Russo has been honored as a Lehigh Valley Business Forty Under 40 in 2015, named one of the publications 25 Women of Influence in 2014, and chosen as a 2013 Woman of Style by Lehigh Valley Style. Russo’s commitment to the community is evidenced by her active involvement as a board member of United Way of the Greater Lehigh Valley, the Greater Lehigh Valley Chamber of Commerce Non-Profit and Business Partners Council, Wildlands Conservancy, The Auxiliary of St. Luke’s Hospital, One Saturday Program, as well as a committee member for Lehigh Valley Food and Wine Festival benefiting Northampton Community College, and Equi-librium Derby Day.